Rumors from Asian suppliers aired Friday suggest Apple’s 7th generation iPad will sport an enclosure design identical to the current 9.7-inch iPad, complete with Touch ID biometric authentication and a headphone jack. Citing sources who conduct business through Alibaba, Mac Otakara reports Apple has no plans to revamp the design of its 9.7-inch “budget” iPad, a model manufactured with the education market in mind. At least one supplier believes a 10-inch model is on the way, but that specification has not yet been confirmed. The rumor is in line with predictions from noted Apple analyst Ming-Chi Kuo, who in February said the low-end tablet would hit market with a 10.2-inch screen. Whether Apple intends to increase the size of iPad’s chassis, or squeeze the larger display into the 9.7-inch version’s enclosure, remains to be seen. As with last year’s refresh, the 2019 iPad will reportedly retain older technology like Touch ID, presumably in a bid to lower build costs. 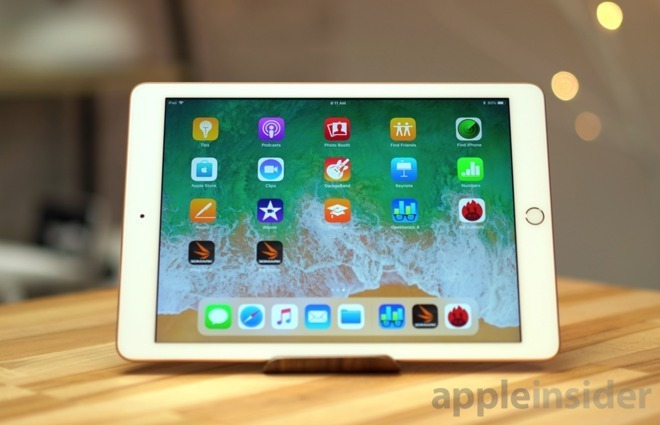 Apple swapped out the fingerprint-based authentication tech for Face ID in its top-of-the-line iPad Pro seres in 2018. Apple’s next-generation iPad will also incorporate a 3.5 millimeter headphone jack, Mac Otakara sources said. The headphone jack is an endangered species in Apple’s mobile product ecosystem, first removed in 2016’s iPhone 7 and 7 Plus, and most recently seeing deletion from iPad Pro in 2018. Today’s report did not specify whether Apple intends to rely on Lightning or USB-C for charging and data connectivity. Finally, supplier sources claim Apple could release the 7th generation iPad alongside an “iPad mini 5” model also rumored to be in development. A release date was not provided, though recent government filings hint that an unveiling could occur in the coming weeks. The rumors suggest Apple’s upcoming refresh will include only minor internal component upgrades. Kuo in his note to investors last month predicted as much, saying both the “budget” iPad and “iPad mini 5” would benefit from faster processors.